Difficult as it may be, Vietnam will strive to attain the best possible result against Iraq, coach Park Hang-seo told a press conference on the evening of January 7, one day ahead of their Group D opener against the West Asian representatives at the ongoing 2019 Asian Cup in the United Arab Emirates. 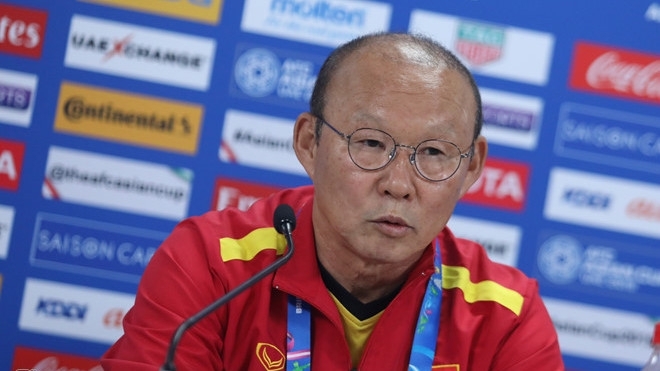 Despite admitting that fitness is a worry of the “Golden Dragons”, the Republic of Korean tactician still voiced his belief in Vietnam’s positive start to their continental campaign. “It promises to be a tough game for us because Iraq is a strong team. Noone can foretell anything, but we will try our best to win the best result”. “The success at the AFC U23 Championship, the Asian Games and the AFF Cup last year gives a strong boost to our confidence. Fans also place greater expectations on the national squad. I know that and I think the whole team have had enough time to prepare for the tournament,” Park said. As the majority of the Vietnamese side are the U23 players, who have just experienced a season with a busy schedule at both the club and national team levels, the 60-year-old coach was worried about the issue of fitness. “The fatigue of my players is real. Many of them suffered from physical weariness as they were summoned to the national squad after a prolonged V.League season. I do not dare to deny that fitness is an issue of worry for the Vietnamese team”. The first match of Group D will take place later today between title favourites Iran and debutans Yemen. These are the two opponents that the “Golden Dragons” will have to face after their meeting with Iraq tomorrow evening. A positive result against the 2007 champions will allow Park’s side to move a significant step towards realising their goal of advancing to the knock-out round.